When using antibiotics, distinctions can be made between different approaches. This derives from the fact that the beginning of an antibiosis is often carried out prior to the final microbiological findings, which is available after approximately 48—72 h of sampling. If the antibiotic treatment is started without knowing the pathogen, based on the typical pathogen spectrum sensible, intermediate and resistant to this infection, it is called a calculated therapy. It should always be noted in this regard, whether the infection was acquired outpatient or nosocomial because the expected bacteria may differ greatly. In some cases, it is necessary to start an Omni Spectra therapy. In that case, multiple antibiotics are combined, so that all kinds of the infection-causing pathogens are detected. In case of an antibiotic usage, because the bacterium reacts sensitively to it in the resistogram, it is called a definitive therapy. For cost and labor savings, this is often converted from a first parenteral to an oral therapy after a few days. This concept is called sequence therapy. A distinction is made between bacteriostatic and bactericidal antibiotics. In case of bacteriostasis, the antibiotic leads to the inhibition of bacteria multiplication. The number of bacteria regresses slowly by the body´s immune system. Bactericidal antibiotics, however, kill the bacteria. Antibiotics, for example, beta-lactam antibiotics, just kill dividing bacteria. However, aminoglycosides also kill dormant pathogens. 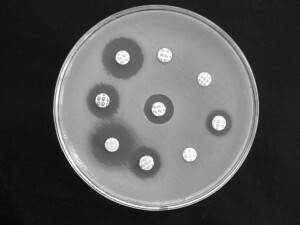 This is an in-vitro test of the antibiotic´s effect on a bacterial strain. The result is called antibiotic or resistogram. In this case, the minimal inhibitory concentration indicates the lowest concentration of an ingredient, at which the multiplication of the pathogen is prevented. The assessment is based on standardized protocols. Thus, the division is carried out in sensitive, intermediate and resistant. The stated limits for this division are based on microbiological aspects, the pharmacokinetics of an antibiotic and the protein binding. It means sensitive when the minimal inhibitory concentration for a corresponding antibiotic is so low that in case of a therapy with usual doses a therapeutic success is expected. A distinction is made between natural and acquired resistance. 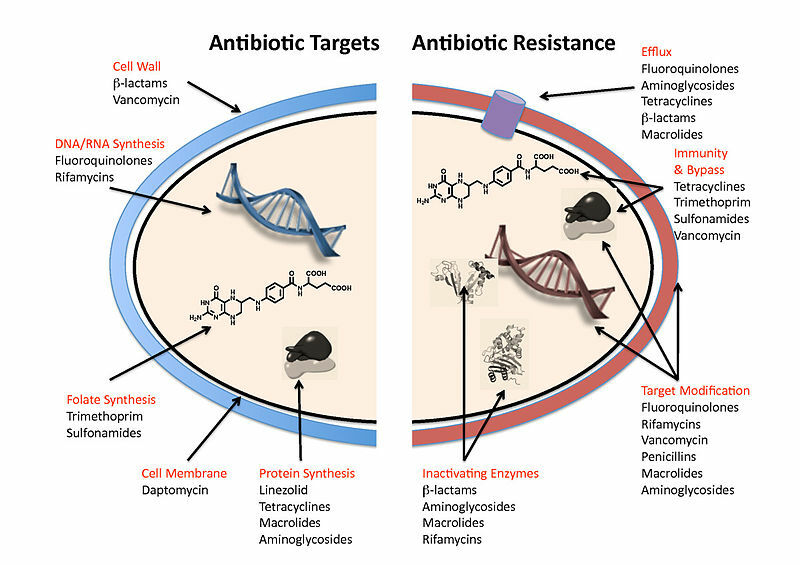 Some bacteria are generally resistant to certain antibiotic classes (for example, Pseudomonas aeruginosa to penicillin) and other primarily sensitive bacteria have obtained a resistance through gene mutation or acquisition of R-genes. Thus, resistant bacteria are able to inhibit, for example, the antibiotic´s penetration into the bacterial cell, change the target molecules, forming enzymes cleaving antibiotics, forming pumps discharging the antibiotic out of the cell or avoid the antibiotic´s effects by alternative metabolic pathways. 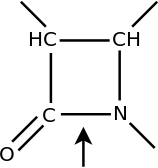 Beta-lactam antibiotics are named after the beta-lactam ring in their structural formula which is typical for them. Their effect is based on the inhibition of transpeptidase and, thus, of peptidoglycan synthesis during bacterial cell division. Thus, they have a bactericidal effect. The effectiveness of β-lactam antibiotics is limited by nature because they are ineffective against Chlamydia, Mycoplasma, enterococci, and Legionella. Additionally, the so-called Eagle effect (also called paradoxical zone phenomenon) occurs: high bacteria concentrations reduce the effectiveness of antibiotics. The cause is a decreased expression of a penicillin-binding protein in the stationary phase of bacteria. Mechanism of resistance, antagonistic effects, and penicillin precipitation also contribute to the Eagle effect. Side effects during the therapy with penicillins are relatively rare since the mechanism of action is based on an inhibition of cell wall synthesis that only occurs in case of bacteria during the division, but not in case of humans. However, up to 10 % of patients are allergic to penicillins and react also allergic to other beta-lactams. These type 1 allergies range from light skin reactions to anaphylactic shock and are better not underestimated. In rare cases, type 3 allergy with interstitial nephritis, Stevens-Johnson syndrome, and hemolytic anemia occurs. A rare, but complicated side effect is the Nicolau syndrome. This, in case of accidental arterial application, causes necrosis and gangrene of fingers and toes to occur. In case of the antibiotic therapy against spirochetes, such as Treponema pallidum or Leptospira interrogans, the risk of a Jarisch-Herxheimer reaction during the decomposition of a large number of bacteria exists. Here, sudden fever, headache and limb pain as well as worsening of the underlying disease pathology is caused by endotoxins being released. The therapy consists of a containment of the host immune system by cortisone. 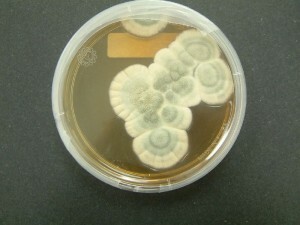 Penicillin G, or benzylpenicillin, is still synthesized by fermentation of fungal cultures. Penicillin is acid-unstable and, thus, cannot be administered orally. In addition, it is labile to β-lactamases. The administration takes place intravenously or intramuscularly, whereby the penicillin from the intramuscular depot is released slowly and continuously. 50 % of the penicillin is protein-bound in the plasma. 90 % of the elimination takes place through the kidneys, whereby it is excreted in an active and an inactive form of penicillic acid. With respect to the penicillin-sensitive pathogens, penicillin G has the highest effectiveness, compared with other beta-lactam antibiotics. 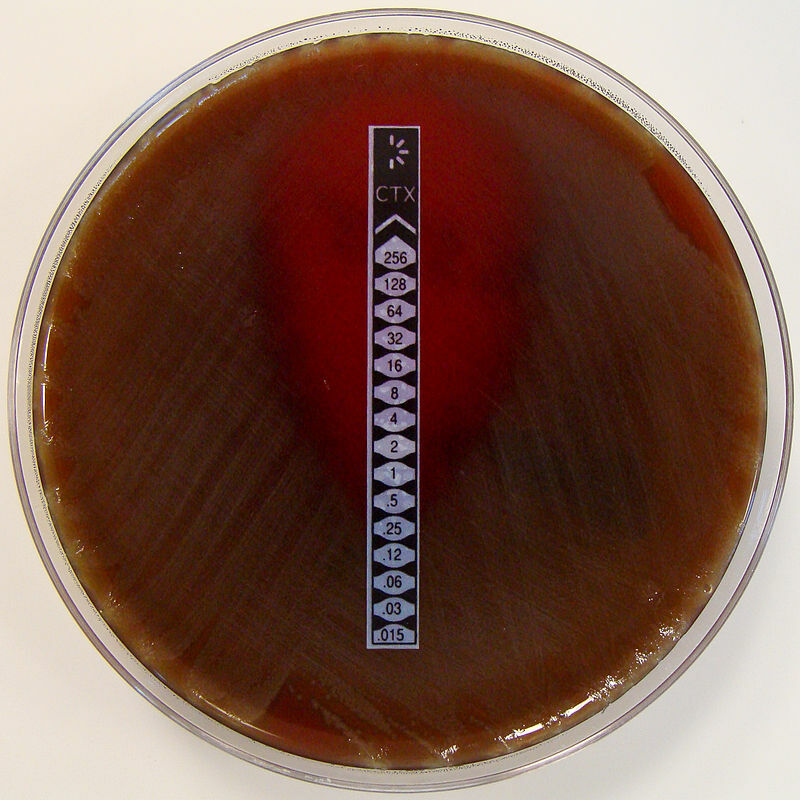 Indications for the use of benzylpenicillin are mainly infections with α-β-hemolytic streptococci, listeria, and bacilli. Examples include erysipelas, scarlet fever, rheumatic fever, endocarditis lenta, syphilis, and leptospirosis. Non-penicillinase-producing staphylococci (account for about 20 %) are susceptible as well. Because of mixed infections and resistances, diseases, such as meningitis and pneumonia, are treated with broad-spectrum antibiotics despite primarily penicillin-sensitive pathogens. Especially the penicillin resistance of gonococci has greatly increased in recent years so that penicillin is no longer recommended in case of gonorrhea. In the skin, lungs, and kidneys, the bioavailability is high. In bones, nerve tissue and muscles, on the other hand, it is insufficient. This results in indications for infections of the mucous membranes and the skin. Very effective is penicillin V, analogous to the penicillin G, against streptococci of the Lancefield group A (Angina tonsillaris and scarlet fever by Streptococcus pyogenes) and in case of minor skin infections such as boils, impetigo contaginosa and Erysipeloid caused by staphylococci. Note: Since penicillins have a bactericidal effect, they should not be coadministered with bacteriostatic antibiotics such as tetracyclines and macrolides. A synergism, however, is consistent with aminoglycosides. The Isoxazolylpenicillins are resistant to β-lactamases produced by staphylococci and are, therefore, also called penicillinase-solid or staphylococci penicillins. However, they are less effective against penicillin G-sensitive staphylococci. They can be applied orally and parenterally. Flucloxacillin is just indicated for the treatment of diseases caused by β-lactamase-forming staphylococci (for example, S. aureus and S. epidermidis). It is often used when skin and mucous membranes are infected. Oxacillin is mainly used in the laboratory, in order to test Staphylococcus aureus on its resistance to oxacillin (referred to as methicillin in the USA). When S. aureus is resistant, it is called oxacillin-resistant Staphylococcus aureus, short ORSA or MRSA. Likewise, there are also resistant S. epidermidis strains, called MRSA. Community-acquired MRSA has a modified penicillin-binding protein so that penicillins cannot bind to the bacteria which, thus, are resistant to all β-lactam antibiotics. The non-community acquired MRSA that primarily occur in hospitals, furthermore, possess resistances to many other classes of antibiotics, such as tetracyclines and aminoglycosides. 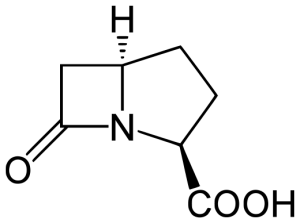 For Aminopenicillins, an amino group which is attached to the penicillins benzyl group is eponymous. Aminopenicillins are not β-lactamase-stable and only possess about one-third of the efficiency of the benzylpenicillin against gram-positive bacteria. But they are very effective against gram-negative, such as E. coli and Proteus mirabilis. Even though ampicillin is acid-proof, it is mostly applied parenterally because of its low oral bioavailability. But it has a good tissue penetration. Ampicillin is indicated in case of infections by hemophilia, enterococci, and listeria. Possible applications include infections of the biliary tract, the respiratory tract, urinary tract infections and COPD exacerbations. Note: Ampicillin is often the trigger of allergic skin reactions, in the form of a measles-like exanthema, mainly in case of patients with chronic leukemia. Amoxicillin is also acid-resistant. Compared to ampicillin, it has a considerably higher oral bioavailability and is thus mostly applied orally. Compared to ampicillin, acylaminopenicillins have an extended efficacy spectrum against gram-negative bacilli, such as enterobacteria. However, since they are not penicillinase-solid, they are ineffective against most staphylococci. Since acylaminopenicillins are not acid-stable, the application can only be administered parenterally, whereby the tissue penetration (cerebrospinal fluid excluded) is good. The excretion takes place mainly via the urine. Piperacillin is characterized by its efficacy against Pseudomonas aeruginosa. Therefore, it is mainly used in combination with the β-lactamase inhibitor Tazobactam as calculated antibiosis during sepsis, pneumonia and abdominal infection with unknown pathogens. Mezlocillin is more effectively against enterococci than piperacillin and ampicillin. For this reason and due to its effectiveness against Enterobacteriaceae, it is used in case of the urinary tract and biliary tract infections. These inhibitors are competitively bound by β-lactamases, cleaved into subunits, which are in turn covalently bound to the enzymes and thereby irreversibly inactivate them. Since enzyme and inhibitor are destroyed, it is called a suicide inhibition. In general, the annulled effect of beta-lactam antibiotics by beta-lactamases, when administered together with one of the inhibitors, is restored and, additionally, the range is extended to anaerobes. Fixed combination products are amoxicillin and clavulanic acid (Augmentan), ampicillin and sulbactam (Unazid) as well as piperacillin and tazobactam (Tazobac). 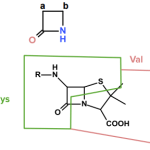 Cephalosporins are bicyclic beta-lactam antibiotics and have an effect such as penicillins by inhibiting the transpeptidase and, thus, the crosslinking of murein strands. Enterococci, Listeria, Legionella, Campylobacter, Chlamydia and Mycoplasma are resistant to cephalosporins. Cephalosporins are introduced in generations by means of their launch. Note: Cephalosporins of lower generations are effective against gram-positive bacteria. Higher generations are also effective against gram-negative, in particular, Pseudomonas, but have a decreased effectiveness against gram-positive pathogens. Cefazolin can only be administered parenterally and is good in tissue penetration. The good effectiveness against Staphylococcus aureus must be emphasized. The main indication for application is the perioperative prophylaxis. This should be done once, 30 minutes prior to the skin incision. In case of penicillin allergy, it may also be used for infections caused by staphylococci. Allergic side effects during the use of cefazolin rarely occur. Compared to cefazolin, the activity spectrum against gram-negative bacteria is extended in case of cefuroxime and cefotiam, which is why they are sometimes referred to as a basis cephalosporin. These two antibiotics can only be administered parenterally as well. They are indicated in case of moderate organ infections with gram-positive or gram-negative pathogens. But because of the insufficient liquor patency, they may not be used in case of meningitis. It should be noted that increasing numbers of enterobacteria form a so-called extended spectrum β-lactamase (ESBL) so that they are resistant to these actual beta-lactamase-stable antibiotics. These broad-spectrum cephalosporins are extremely effective against enterobacteria and other gram-negative bacteria, but can only be administered parenterally. Ceftriaxone is often preferred in clinical practice since it must be administered only once a day. Broad-spectrum cephalosporins are particularly effective against typical meningitis pathogens like pneumococci, meningococci, and hemophiliacs, which is why they find their main application here. Other indications for the calculated initial therapy with these antibiotics are severe infections that must be treated in the intensive care unit. Compared to the cephalosporins of the 1st and 2nd generation, they are less effective against the Enterobacter species E. cloacae and Citrobacter freundii as well as streptococci and staphylococci. Gaps in the spectrum are closed through the combination with aminoglycosides or metronidazole. It is worth mentioning that these two antibiotics are excreted via bile, so a transient pseudocholelithiasis can develop during the application of ceftriaxone. Therefore, the application during acute hepatitis and icteric newborns are also contraindicated. Note: Ceftriaxone must never be administered with calcium-containing IV solutions since calcium-ceftriaxone precipitates can occur, which can be fatal for infants. Ceftazidime is a reserve antibiotic for the intravenous treatment of severe infections with suspected P. aeruginosa participation. Therefore, it is especially applicable in case of neutropenic and hospitalized patients. Through Clindamycin, the gap, with respect to staphylococci and anaerobes, can be closed. Like ceftazidime, cefepime is effective against gram-negative bacteria, especially Pseudomonas. But in contrast to 3rd generation cephalosporins, it is also very effective against staphylococci and streptococci. The main indications are biliary tract infections, peritonitis, nosocomial infections and meningitis (cave: ineffectiveness against listeria). Carbapenems, like penicillins and cephalosporins, are β-lactam antibiotics. They are characterized by a broad bacterial spectrum and a high β-lactamase resistance. They must be administrated parenterally, due to low plasma protein binding, the tissue distribution is good. The carbapenems are primarily metabolized through the kidneys so that during renal insufficiency a dose adjustment is necessary. Currently, three carbapenems are available on the German market: imipenem, meropenem, and ertapenem. Imipenem has the best efficacy in the gram-positive area, meropenem and ertapenem are more effective in the gram-negative area. Indicated they are absolute reserve antibiotics in case of serious life-threatening infections of the abdomen, the sexual organs, bones, kidney and the respiratory system. Ertapenem is also used as a perioperative prophylaxis in colorectal surgery. This carbapenem is also applicable for targeted treatment of multi-resistant gram-negative pathogens (ESBL). However, through the formation of metalloenzymes, especially Klebsiella pneumoniae (KPC for Klebsiella pneumoniae carbapenemases), Acinetobacter baumanii complex and Pseudomonas aeruginosa can become resistant. Note: Since imipenem is rapidly degraded by the endogenous enzyme dehydropeptidase I in the kidney, it is always combined with the dehydropeptidase inhibitor cilastatin. Bacterial glycoprotein that binds to the alanine terminal of the peptidoglycan. Resistant organisms have an altered terminal — decreased affinity for vancomycin. Used for serious infections only. Does not cross the blood-brain-barrier — used intrathecally. Used orally for luminal infections of the gut. Used in topical treatment and decontamination syndromes. Used in staphylococcus colonization of the skin. Marked nephrotoxicity — not used parenterally. The monobactam antibiotic aztreonam is rarely used, even though it represents a good alternative in case of β-lactam allergy. Furthermore, it is extremely effective against gram-negative bacteria, Acinetobacter strains, anaerobes and Stenotrophomonas maltophilia. The mechanism of action of these antibiotics is based on inhibition of the bacterial DNA gyrase. Thus, the supercoiling of the DNA is abolished, so that the DNA breaks and no longer fit into the bacterial cell. Hence, the fluoroquinolones are bactericidal. Except for norfloxacin, fluoroquinolones have also a bactericidal effect in the stationary phase of bacterial growth. The spectrum includes gram-negative bacteria like Neisseria, Haemophilus, and Bordetella. Enterobacteria and Pseudomonas are also covered. The effect against streptococci and anaerobes, however, is not sufficient. After oral administration, the absorption, as well as the volume of distribution, is high. However, the absorption of fluoroquinolones is severely limited by a simultaneous intake of antacids or iron-containing preparations. Excretion takes place via the kidneys and the faeces. Resistance to fluoroquinolones is based on point mutations in the gyrase gene and permeability disorders (reduced influx and active efflux). The development of resistance during therapy with fluoroquinolones happens relatively quickly. For this reason and the relatively widespread use in recent years, resistant Pseudomonas aeruginosa, Staphylococcus and E. coli strains are often found. Antibiotics of the fluoroquinolone group are contraindicated in pregnancy, for children (since they damage the articular cartilage) and patients with epilepsy. 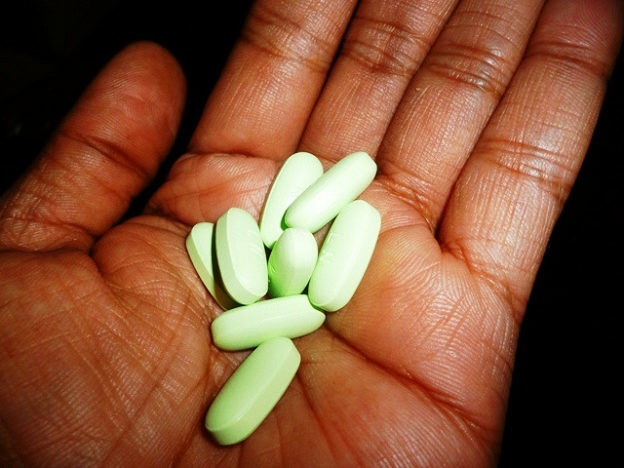 Common side effects during treatment with fluoroquinolones are gastrointestinal reactions, central nervous reactions like dizziness, headaches, and tiredness as well as allergic reactions. Ciprofloxacin is a typical fluoroquinolone with the above-mentioned efficacy spectrum. It is not absorbed orally as well as other fluoroquinolones but achieves very high tissue levels when administered intravenously. The excretion mainly takes place via the kidneys, which is why there are restrictions on use during renal failure. Salmonella infections, bacterial gastroenteritis, gonorrhea, mycoplasma infections and Bartonella are indications for ciprofloxacin. In addition, it is applied for chemoprophylaxis in case of neutropenic patients. Furthermore, in contrast to other fluoroquinolones, it can be used in case of children with cystic fibrosis. 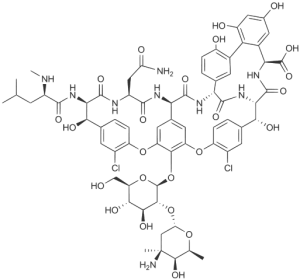 Of all fluoroquinolones, ofloxacin is best absorbed and has a longer half-life period. Furthermore, it is less heavily metabolized. However, there are losses in the efficacy, especially against Pseudomonas, Chlamydia, and enterococci. Glycopeptide antibiotics like vancomycin inhibit the polymerization of murein strands and, thus, have a secondarily bactericidal effect. They cover almost all gram-positive bacteria (Caution: growing number of vancomycin-resistant enterococci = VRE) but are ineffective against gram-negative bacteria. Glycopeptide antibiotics are not resorbed orally and the absorption in the brain is very bad. In internal organs and abscesses, on the other hand, good effective concentrations are reached. Since the excretion occurs at 90 % via the kidneys, during renal failure toxic concentrations can be reached very quickly and particular care is required. Another contraindication exists for deafness because it is fostered by glycopeptide antibiotics. Resistance to vancomycin is based on a change in the murein strands. Instead of the usual alanyl-alanine residue resistant, bacteria have a pentapeptide at their murein strands. The binding of vancomycin to this pentapeptide is significantly worse. Resistance genes are VanA which is plasmid-coded and causes a resistance to vancomycin and teicoplanin. VanB and VanC, however, only encode resistance to vancomycin. As mentioned above, these resistances especially involve Enterococcus faecium (but less frequently E. faecalis) and S. aureus as well. These only severely limited staphylococci are called VISA for vancomycin-intermediate S. aureus. Vancomycin is indicated for infections with staphylococci in case of penicillin allergy, resistant corynebacteria, and enterococci. It is the medication of choice against endoplastitis, so for example, the infection of a prosthetic heart valve or a peritoneal catheter, and is often combined with rifampicin or gentamicin, in order to cover resistant staphylococci and enterococci. For further outpatient treatment of such diseases, teicoplanin is applicable. 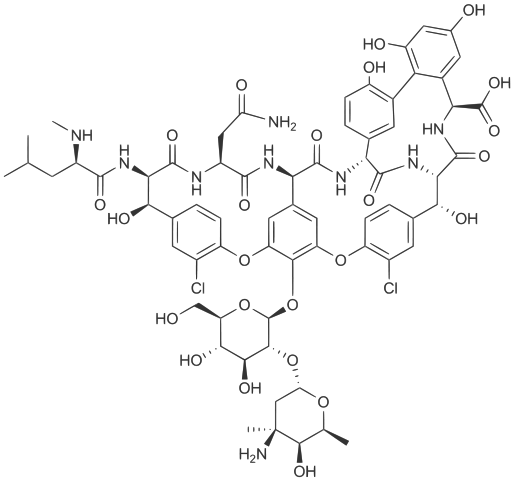 It is a glycopeptide as well but has a longer half-life period than vancomycin. In case of pseudomembranous colitis caused by Clostridium difficile vancomycin can be orally administered and is nowadays often preferred with respect to metronidazole. 1. The term VRE refers to a vancomycin resistance, so which pathogen is meant? 2. The Jarisch-Herxheimer reaction during the treatment with penicillin occurs primarily in case of which pathogens? 3. Which of the following antibiotics is not primarily metabolized by the kidney and excreted via the urine? Antibiotics: Initial Concepts. (n.d.). Antibiotics, 3-10. doi:10.1128/9781555817886.ch1. Butler, C. C. (2012). Antibiotics: Responding to a Global Challenge. Antibiotics, 1(1), 14-16. doi:10.3390/antibiotics1010014. Cytryn, E., Markiewicz, Z., &Popowska, M. (2017). Antibiotics and Antibiotics Resistance Genes Dissemination in Soils. Soil Biology Antibiotics and Antibiotics Resistance Genes in Soils,151-190. doi:10.1007/978-3-319-66260-2_9. Longmire, W. P., & Smith, S. W. (n.d.). The Surgical Use of Presently Available Antibiotics. Antibiotics and Chemotherapy,89-144. doi:10.1159/000386624.